Dryden Is Home: David Makar, Dryden, Ontario? Hi Dave this is too strange. Did you know there is another Dave Makar in the world and he lives in Dryden as well? But Dryden, Ontario Canada and he is 51. We came across your name when a co-worker googled Dave’s name. We thought it was a joke when we saw the Dave Makar was running for Democrat Party not realizing it was you and not the one we know. Anyway thought I would email you and let you know. I am his wife Julie. If you want to contact us our email is xxxx@drytel.net. There are not to many Makar’s is the world with this spelling, or so we thought. Who knows maybe you are related somehow. Funny story...my sister's name is Julie. Thanks for the email. The campaign has been incredibly busy and I’ve been a little behind in responding to emails. My sister’s name is Julie! Well, you almost couldn’t have put Dryden, Ontario and further away from Dryden, NY and still been in Ontario. My first thought was I could drive up to the border (2 hours north), but then I saw the map! Whoah! I went to Duluth once – that was a long way from home (in Massachusetts at the time). What does the David 51 Makar do? Is he Ukrainian? How long has he been in North America? Hi We were not sure you would respond. Yes the two Dryden's are a distance apart. It takes us about 7 hours to get to Duluth and haven't been there for years. Dave is a Ukrainian but born in Grandview, Manitoba. His parents were both born in Rossburn Manitoba and their parents were from Austria. Dave's dad Mike- parents were William Makar and Annie Matskiw and his mom Florence was a Leshchyshyn. (not sure if I have the spelling right) Both Dave's parents are still living and his dad is 86 and mom is 79. I know that other family names are Lazaruk, Kokorutz and others I'm not sure how to spell. Would have to quiz Dave's parents a bit more. There does not seen to be too many Makar's spelled the same way and it is always interesting to find out if somehow we are related. Glad things are going well with the campaign and let us know your family tree as well. So there you have it. I replied back with the family tree on my side. Our family tree doesn't go back too far, mainly because my dad and aunt and uncle and grandparents were all born in Europe and moved here in the 1949. I don't have anything documented beyond the five of them. If I'm ever in Dryden, Ontario, I'll have to find David Makar. Dryden, New York, and Dryden Ontario have been connnected from time-to-time. In 1957, during the Village of Dryden's Centennial celebration, the mayor of Dryden, Ontario, came and was honored. When I was mayor of Dryden, NY, one summer's day in the late 1980's, some nice people from Dryden, Ontario, appeared unexpectedly at my door. They brought me some tourist information about Dryden, Ontario, and a baseball cap from their mayor (which I still have). Dryden, O. is a city of around 5,000 people. Its big industry is paper mills. Besides Dryden, Ontario, there is also Dryden, Michigan--a village uncannily similar to Dryden, N.Y. The Town historian from there made a trip out once when I was mayor--a very nice person. She gave me a post office mailbox from there that had been made into a coin bank. They were sold at one time as a fundraiser for their historical society. There are also Drydens in Texas, Maine, Minnesota, Washington, and Virginia, that I am aware of. Most are pretty small. I don't know if any of the others harbor David Makars. I found a woman who was "Meagan DifficultToSpellMaidenName" as well and emailed her in 2000, I think. She wasn't nearly as struck by the coincidence as I was. It's nice that the other David (or at least his wife) got in touch with you! 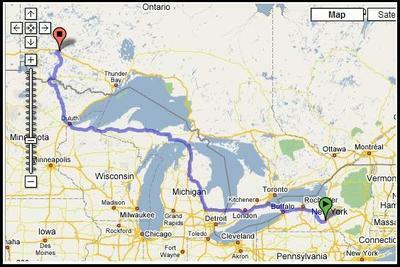 I would drive it the northern route going (above all the great lakes), for fun, then under coming back. It kinda looks to me that, ahem, Dryden, Ontario is waaaay out there. I find this extremely interesting. My boyfriend stumbled across this some how (I have no idea), and told me about it. Dryden, ONT is a beautiful place -- but then again, I'm biased. It's my home town. And the last commenter -- my dad!